Today’s recipe is courtesy of Hungry Girl! These mushrooms are brimming with the flavors of sweet carrots, tart lemon juice and fresh basil. Preheat oven to 400°F. Coat a baking sheet with cooking spray and roast 4 portobello mushroom caps until tender, about 20 to 25 minutes. Chop remaining mushroom cap and set aside. Remove mushroom caps from oven and keep warm. Meanwhile, coat a nonstick stick skillet with cooking spray and set over medium heat. Add carrot and onion; cook until soft and starting to brown, about 10 minutes. Add reserved chopped portobello cap and shitake mushrooms and cook to soften mushrooms, about 4 to 6 minutes. Add TVP and broth (or water) to mushroom mixture. Cook until water is absorbed, about 5 minutes. Add vinegar and lemon juice. Stir in fresh basil and season to taste with salt and pepper. Arrange portobello caps in a shallow roasting pan. 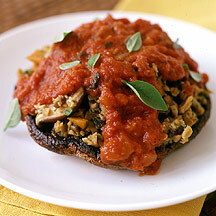 Scoop 1/2 cup of TVP filling over each mushroom and top each with 1/3 cup of tomato sauce. Warm in oven 10 minutes. Garnish with fresh basil before serving. Yields one stuffed cap per serving. Sounds YUMMY, right? It is! I LOVE making these. Let me know what you think….